HUDA Ashiana Scheme is a new housing scheme of Haryana Urban Development Authority launched in Gurgaon and Rewari for the allotment of 1496 flats to BPL and EWS category of the society. 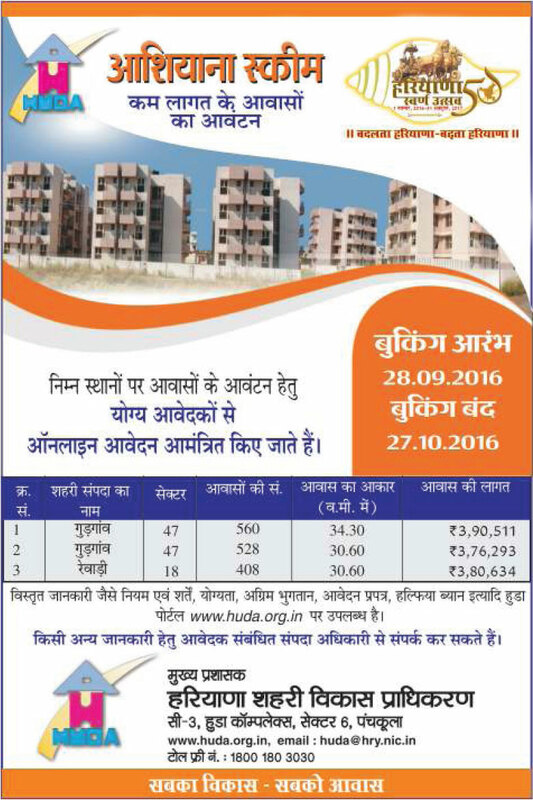 Huda has published a notification is a Jagran newspaper for inviting applications for these flats. Flats in the scheme are located in Sector-47 Gurgaon (Gurugram) and Sector-18 Rewari. Majority of 1088 flats in HUDA Ashiana scheme are located in Gurgaon (Gurugram) Sector-47 and remaining 408 flats are available in Rewari Sector-18. These housing units are available in the size of 30.60 square meter and 34.30 square meter. The cost of flats available for allotment in the scheme is varies from Rs. 3,76,293/- which goes upto 3,90,511/-. Application for the same will start from 28 September 2016 through online. Registration for flat in the scheme will start from 28 September 2016 and the last date of application submission is 30 November 2016. Applications for the same will be available through online mode. Eligibility, Application Process, Terms and Conditions, Application Form and other information will be available on the official website of HUDA at www.huda.gov.in on 28 September 2016. Huda is making fools. Customers are not getting any proper response from last 2016. How much more time, they would take for results? They have blocked their hard-earned money from last 2 year. ALL MOST 1 YEAR HALF MONTH HAS OVER . ITS WILL BE DRAW OR GOVERMENT HAS TAKEN MONEY FROM CITIZEN .